Wow, have we been busy! Last Monday we moved! We are buying Tyler's mom's house (the house he grew up in) and they bought ours. 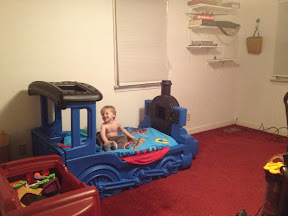 Tristan is in Tyler's old room and wants it to be a Star Wars room despite his Thomas bed. Scarlett is in Katelyn's old room and we are in the master. On top of trying to dig our way out of the box forest (haha), last week was Thanksgiving. Add to that the fact that it's time to decorate for Christmas and whew! I'm overwhelmed. She LOVES it! 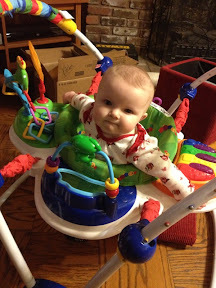 She's not a big jumper like Tristan was, but she wants to stand ALL the time.